Winchmore dispatched top-of-the-table Potters Bar 5-1 last week and took that energy into their match against Bishops Stortford, a side that had pipped them 5-4 with a last minute goal back in October. Stortford started the game with 10 after a player failed to add an ‘8’ after the ’N1’ on his satnav. Winchmore took advantage by dominating possession from the first whistle. They worked sensibly to move the ball around the pitch – particularly along the backline of Dray, Carrick and Franks – to tire their opponents. Stone, Lappin and Zeff worked the wide positions to offer plenty of opportunities to move the ball downfield. Rewards were swift. Foad bagged two thumpers and provided an assist for Smith to tap in at the post from a short corner. Man-of-the-match Mall made mincemeat of the Stortford backline and scored a brace, including one that followed a quick-witted pounce on the centre-back after some sloppy ball control. A 5-0 margin at half-time was a fair buffer between the sides. Winchmore set to work in the second to contain their opponents and strangle the game, but Stortford were restored to 11 and came out stronger. Gatting – who once again stepped up for the team and played in goal instead of the usual centre-back – was forced into some fine stops when called upon. Machray and Smith continued to control the middle and halted Stortford’s advances. But it was Winchmore’s match and they capped it with a sixth goal from Sumner. And there could have been more. Foad was denied a hat trick with a short corner that was adjudged to have been hit above the height of the backboard (he claims to have footage of the incident – probably best not to bring it up). The win lifts Winchmore to fourth and they have three more points than at the same stage last season. This weekend they’re looking to take their free-scoring run into the game against an ever-robust Vauxhall side and climb further up the table. The M2’s faced a tough game vs 4th place WGC on Saturday. Without the pivotal Dominic Smith in centre midfield the home side’s defence looked exposed. Winchmore were however creating chances in attack and a short corner was flicked home by Rob Dowling to give Winchmore the lead. As the opposition became more and more frustrated the game heated up. Some clumsy work from the Welwyn defender resulted in 3 stitches for Rob Dowling thanks to a stick in the face. Losing Rob in the centre caused further frustration for Winchmore who now faced wave after wave of attacks from the opposition. Eventually with 5 minutes remaining the Welwyn attacker lost his man and fired past Nick in goal, leaving the score at 1-1. The score remained at 1 each until the final whistle which was probably a fair score for both sides and leaves the 2s in 6th. 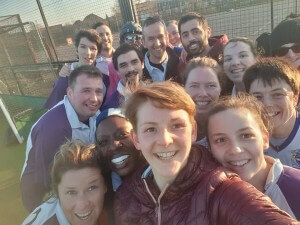 Despite frosty conditions in the morning, which put paid to our usual junior coaching session, the mixed team headed over to Northolt for a cup match with Eastcote in the England Hockey Mixed Tier 2 Championships. 2 minutes in Eastcote scored and it looked like we were going to be fighting an uphill battle after they scored a second not long after. But coach Gavin to the rescue scored to bring us to 2-1 and give the team a boost. A second by Leo in the 2nd half gave us further hope at 3-2, but Eastcote scored another couple making the final score 5-2. Matt falling over a lot. Rachelle did not fall over!!!!! The return of Rosemary Basil Sparrey Wilkins to the Winchmore team gave us a great boost of energy! Well played everyone and looking forward to mixed hockey in the summer up at Broxbourne!! !